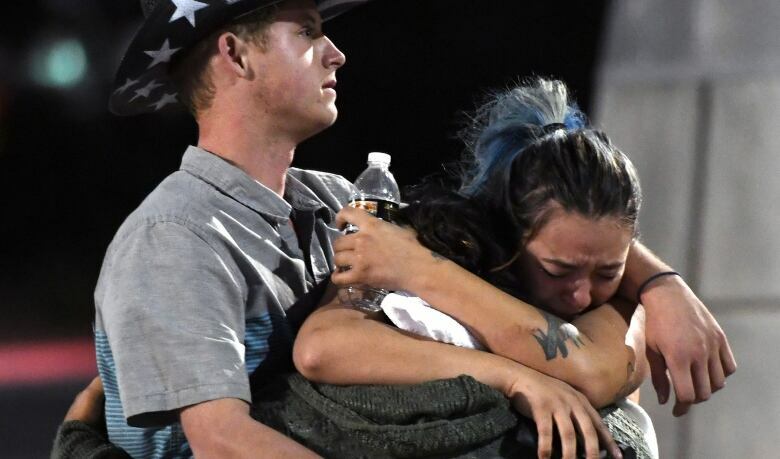 A mass shooting in Las Vegas targeting concertgoers gathered for the last night of a popular country music festival has left at least 59 people dead and more than 500 injured. Here are some images from the scene. 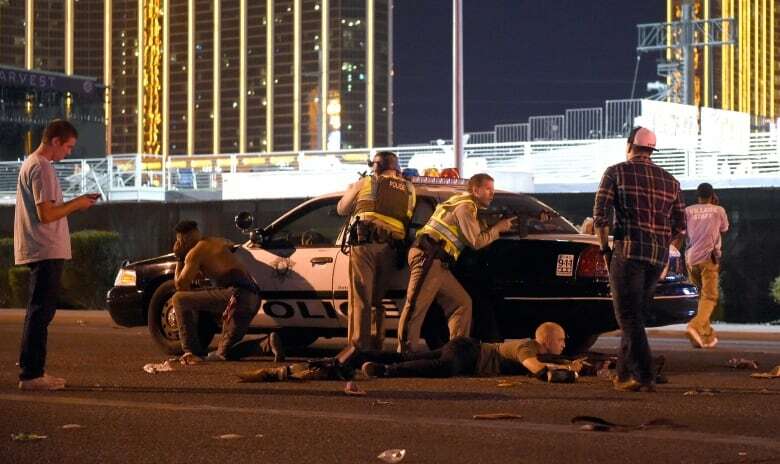 Police say Stephen Paddock opened fire from a room on the 32nd floor of the Mandalay Bay Resort and Casino, shooting concertgoers at the Route 91 Harvest country music festival in Las Vegas, leaving at least 59 people dead and more than 500 injured. Paddock killed himself inside a hotel room before police entered the suite, a law official said. 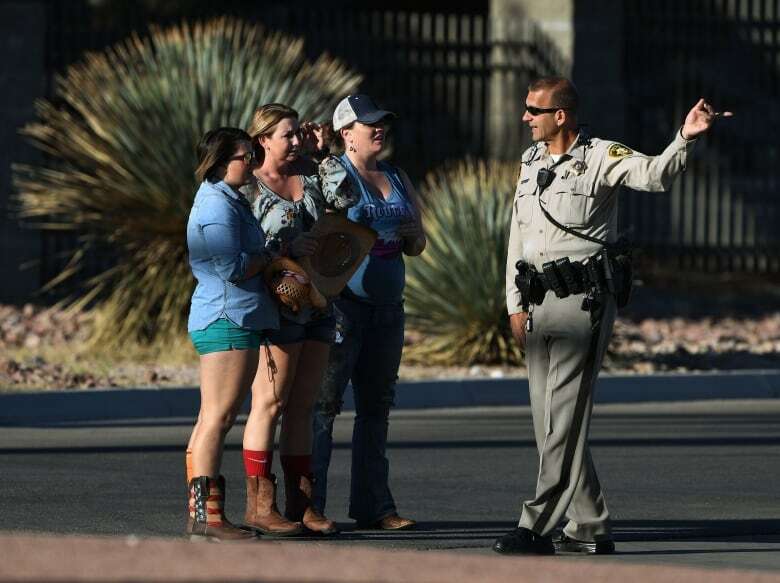 Police officials have blocked off access to the Sun City Mesquite community where Paddock lived in Mesquite, Nev.
Country singer Jason Aldean was performing when the shooting started, sparking a mad scramble for shelter. 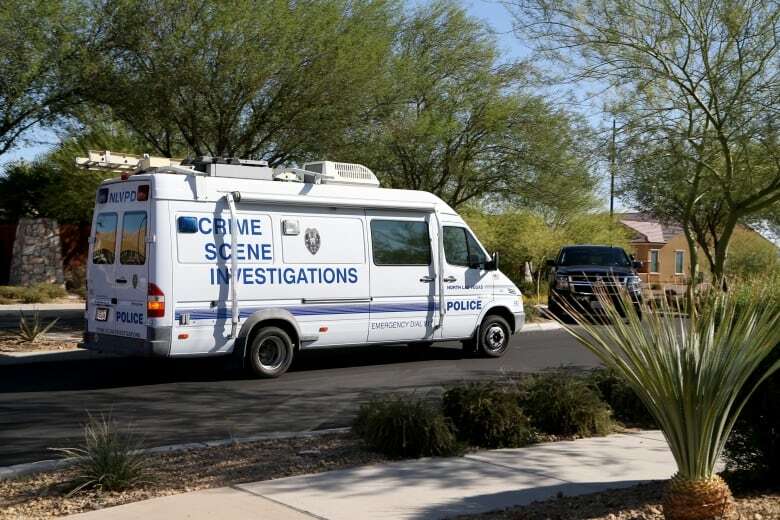 A North Las Vegas Police Department crime scene investigations vehicle arrives in the Sun City Mesquite community. Paddock owned a single-family home in the retirement community along the Nevada-Arizona border. U.S. President Donald Trump addressed the country on Monday and said the shooting was an "act of pure evil." 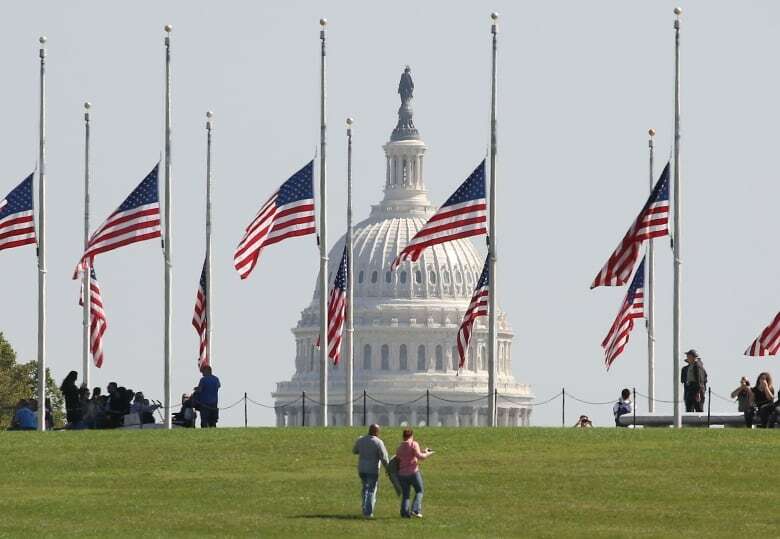 Trump ordered the flags on all federal buildings to fly at half-mast following the mass shooting. 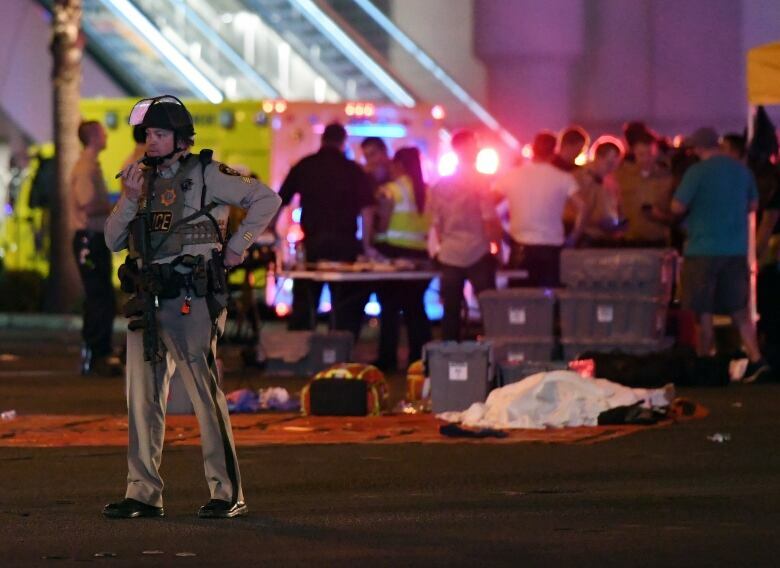 The sheriff said a check of federal and state databases showed Paddock was not on law enforcement authorities' radar before the bloodbath. Here, a Las Vegas police officer investigates on a side street near the Las Vegas Village. 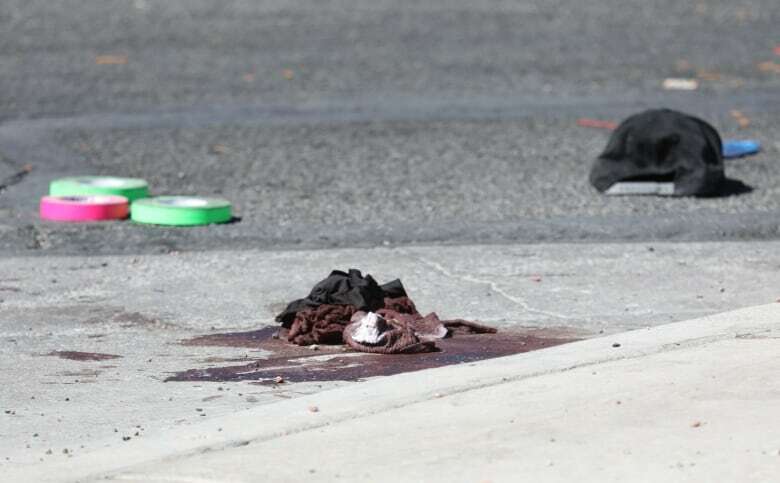 Bloodstained clothing lies in the street near the scene of the mass shooting. 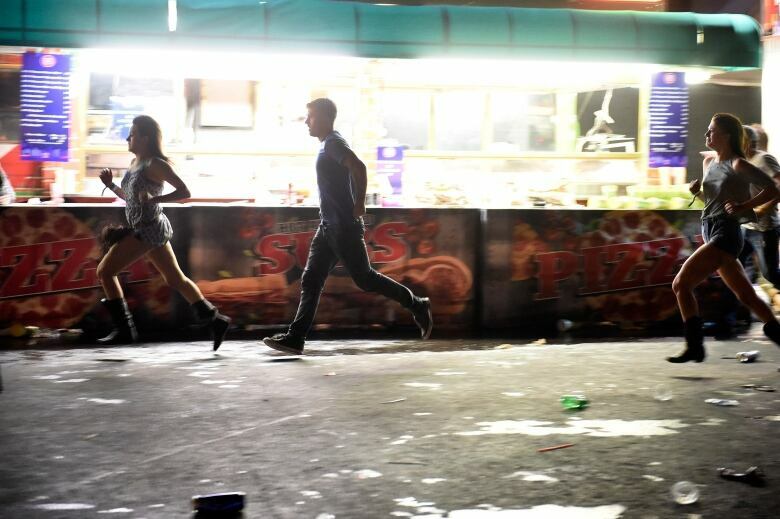 Three festivalgoers ask for directions as they leave the area around the Mandalay Hotel. 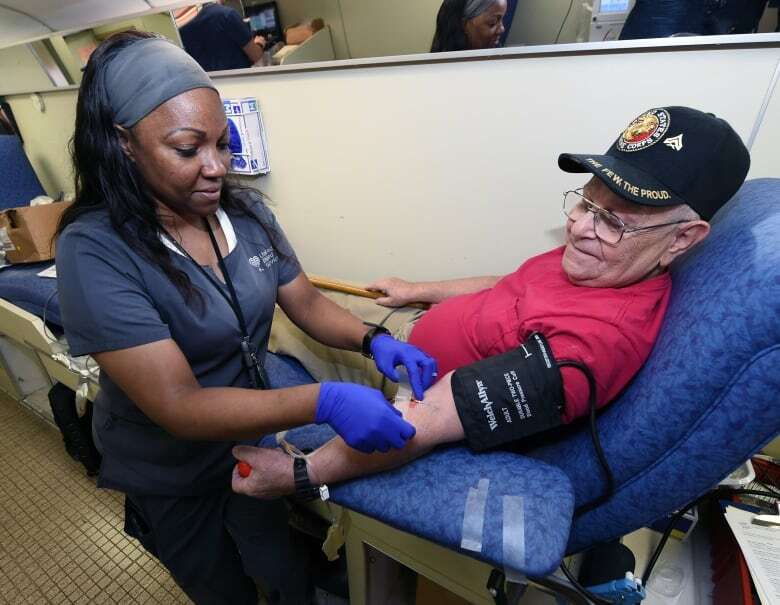 United Blood Services phlebotomist Sha-Na Hill takes blood from Richard Williams of Nevada at a special United Blood Services drive at a University Medical Center facility to help victims. 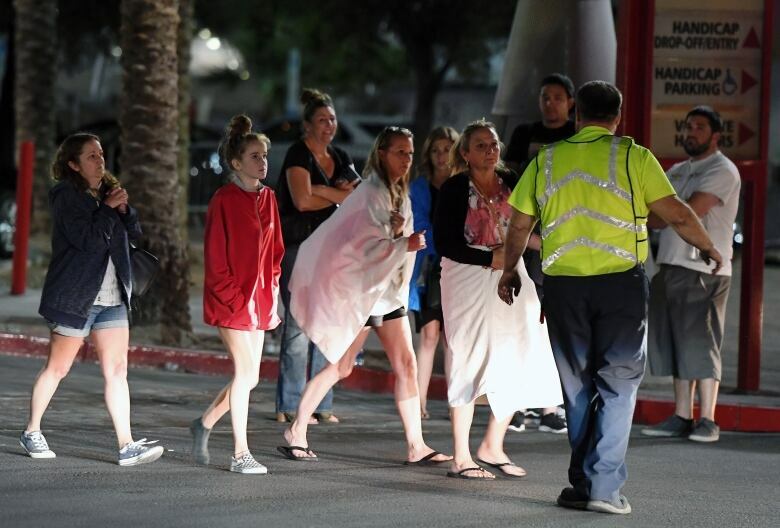 In the aftermath of the shooting, survivors comforted one another. Three Canadians, a 23-year-old man from B.C. and two women from Alberta, were confirmed dead. Two women from Manitoba, and two men from Saskatchewan were injured in the shooting and were in hospital. People are directed to rides outside the Thomas & Mack Centre. 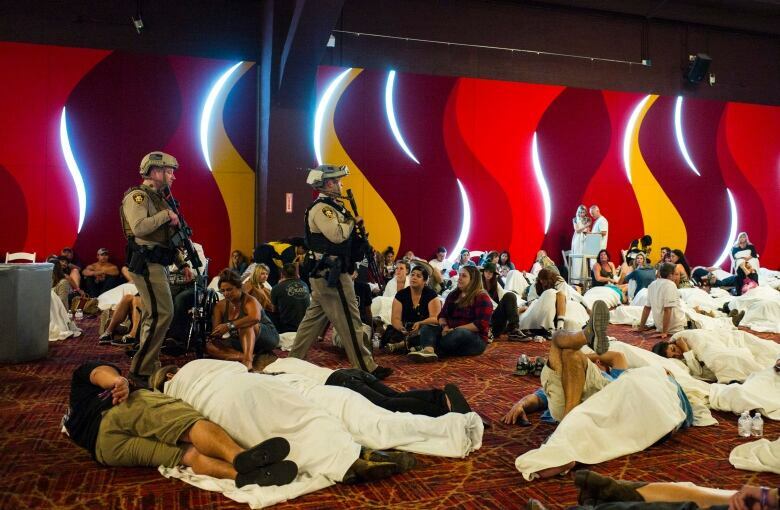 Those who could not go to the hotel-casinos that were closed after the shooting are temporarily staying at the centre. 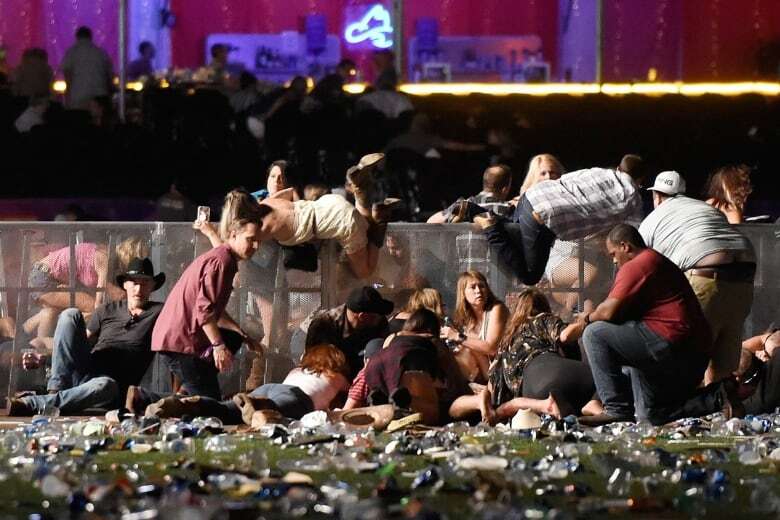 A gunman in a room on the 32nd floor of the Mandalay Bay casino unleashed a hail of bullets on an outdoor country music festival below. 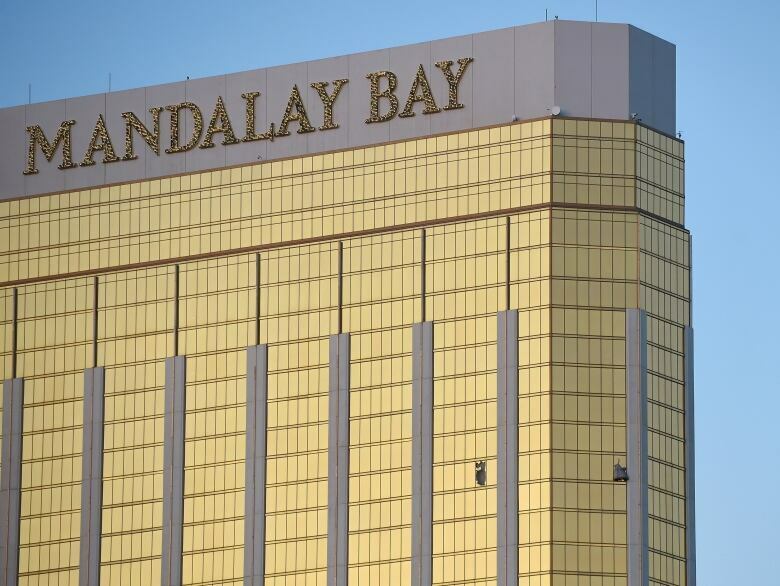 SWAT teams using explosives stormed the gunman's Mandalay Bay hotel room in the sleek, gold-coloured glass skyscraper and found he had killed himself. Las Vegas police walk through a convention centre area during a lockdown at the Tropicana following reports of an active shooter on the Las Vegas Strip. 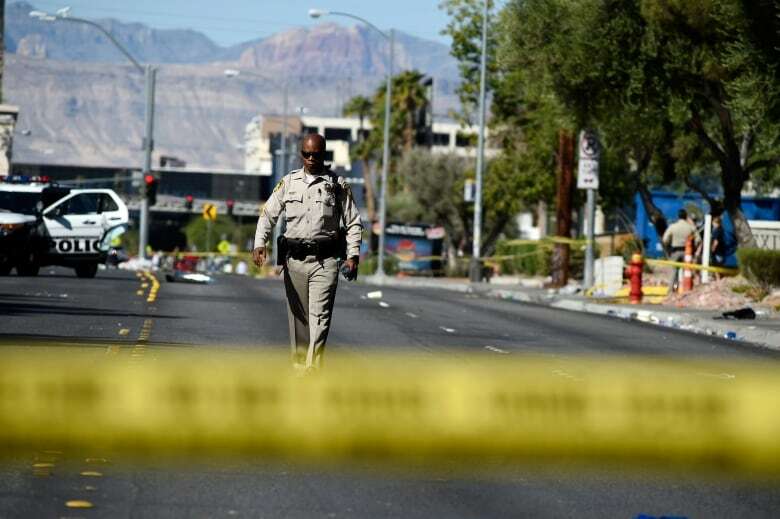 The killings at the sold-out festival mark the deadliest mass shooting in modern U.S. history. The previous one was in Orlando, Fla., where 49 people were killed when a gunman opened fire at the Pulse nightclub in June 2016. 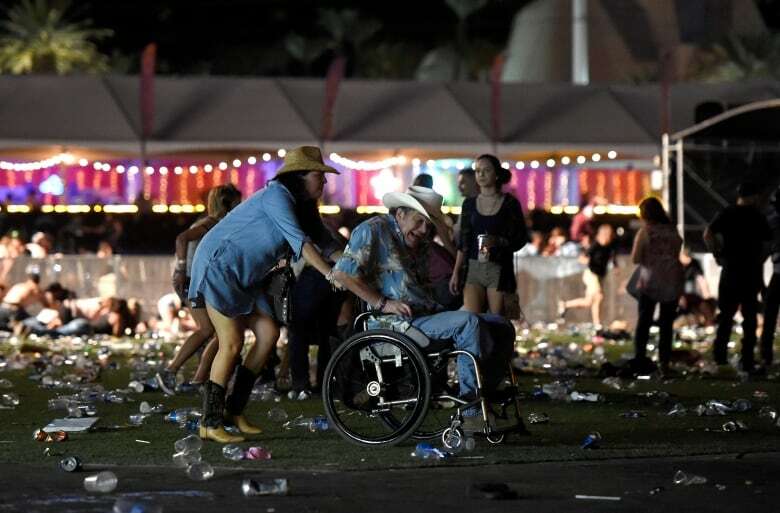 Cam (Buzz) Brainard, a country radio host who witnessed the mayhem, told CBC News that the shooting sparked chaos and panic as people tried to flee the crowded festival grounds. Brainard said he just "ran and ran" when he heard the sound of gunfire, surrounded by a massive crowd of moving people. "It was chaos." 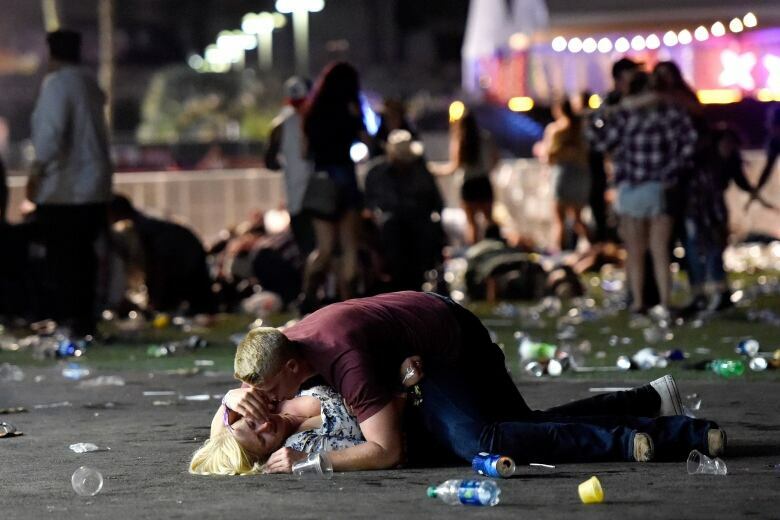 A man lies on top of a woman as others flee the Route 91 Harvest music festival grounds. A man in a wheelchair is taken away from the festival. 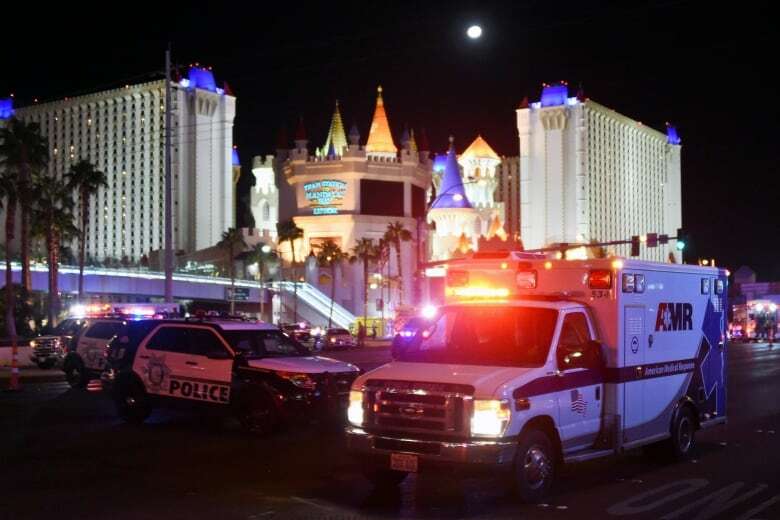 Police shut down the usually busy Las Vegas Boulevard, and authorities across the state and federal ranks converged onto the scene as dozens of ambulances ferried the injured to hospitals. 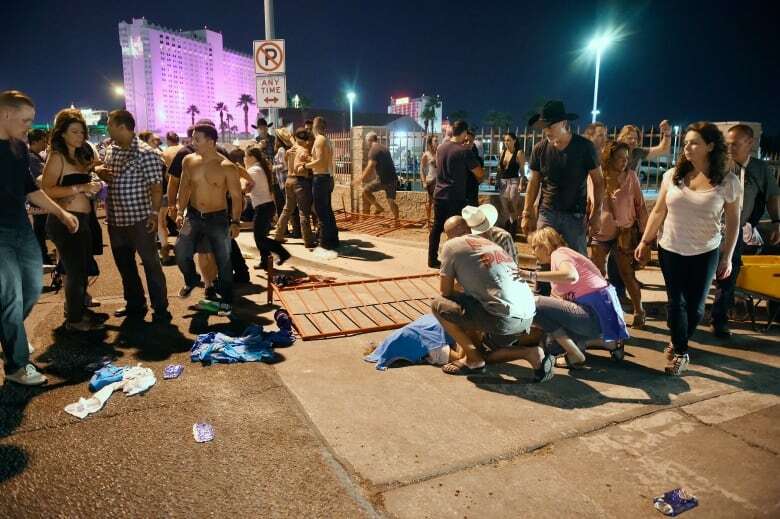 People tend to the wounded outside the Route 91 Harvest music festival grounds. More than 500 people were taken to hospital. 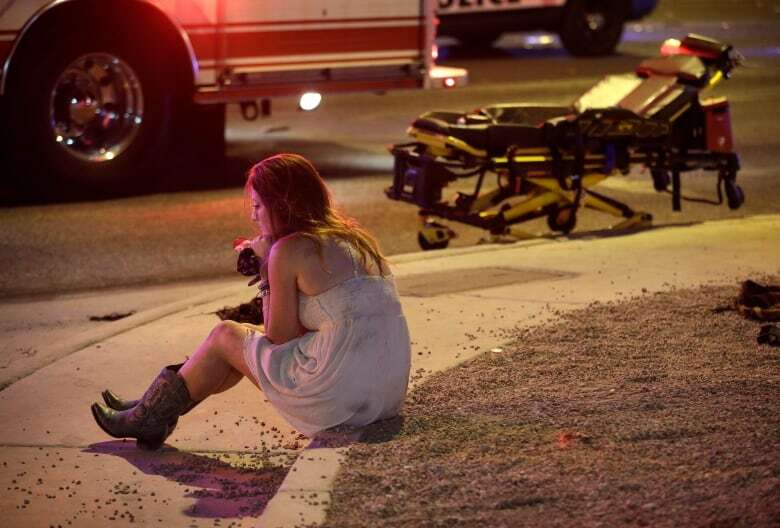 A woman sits on a curb at the scene of a shooting outside a music festival along the Las Vegas Strip. 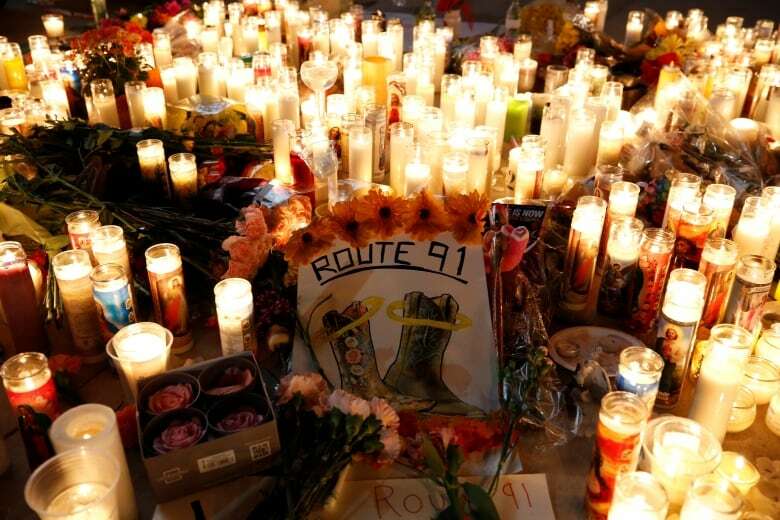 On Monday, a candlelight vigil was held on the Las Vegas strip. Mourners gathered to light candles and remember those lost and affected by the massacre.